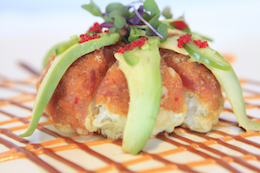 Crispy sushi rice topped w/spicy tuna, avocado, jalapeno and tobiko. 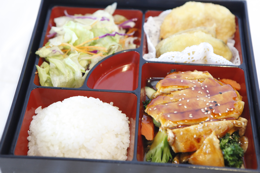 5 pcs of seared salmon w/tobiko, scallions & fried lotus root & spicy lemon dressing. Tuna, salmon, white fish, mango, served w/lemon vinaigrette. 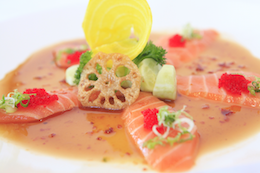 Lightly torched fatty salmon, mango, asparagus, ikura, micro herbs, served with chef’s special sauce. Tuna w/cucumber, avocado, served with ponzu sauce. Fried wonton tacos filled w/tartars of fresh tuna, salmon, yellowtail & shiitake mushroom mixed w/soy mustard sauce. Tuna, onions, fried chips with Chef&apos;s special sauce. Tuna, avocado, wasabi tobiko on top, served with Chef&apos;s special sauce. 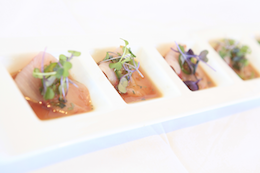 Albacore tuna, ginger flower, caviar, served with Chef&apos;s special sauce.